Every year, the Albion College Theatre Department puts on four main shows. These plays give theatre students many challenges and experiences, which will be useful after graduation. They also provide thought-provoking entertainment for all inhabitants of Albion. 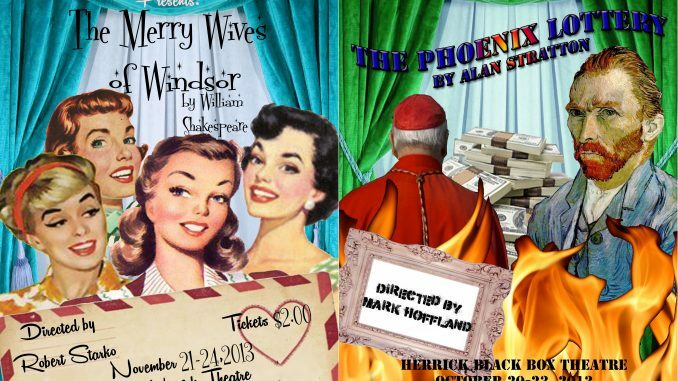 The first show, “The Phoenix Lottery,” is a modern comedy written by Canadian, Allan Stratton. It premiers on Oct. 3 at 8:00 p.m. in the Herrick Auditorium Black Box Theatre. Mark Hoffland, a theatre professor and director of “The Phoenix Lottery,” is looking forward to this play. Amber Cook, the costume designer, shop supervisor and adjunct instructor for the theatre department also is excited to work on these upcoming plays. Hoffland agrees the play has a plethora of subjects for the audience to witness. Aside from the intricate set, there are other qualities of “The Phoenix Lottery” that are not in a typical Albion College play. The second play being shown this semester is “The Merry Wives of Windsor,” a Shakespeare play with a 1950’s twist. It premieres on Nov. 21 at 8:00 p.m. in the Herrick Auditorium Black Box Theatre. “We picked this play because we have a lot of women in the department, and this play of Shakespeare’s has mostly female roles,” Hoffland said. Theatre students will create the costumes the actors will wear. Some acting students create their costumes as well. This time, though, it will be a little different than a normal sewing pattern. “The Merry Wives of Windsor” should hold many laughs and with its modern look, bring a new feel to an old play. The system in place allows for many different kinds of shows to be prepared and preformed. “They all have their own individual personality and each one is exciting in its own way,” Hoffland said.